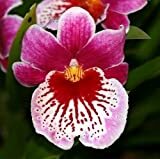 Miltoniopsis growing orchid leaf plant of the genus Miltoniopsis also known as Pansy orchid, Miltoniopsis perennial evergreen plant used as ornamental plant, can grow in subtropical climate or as houseplant and growing in hardiness zone 11-12. Leaves color green in in oval shape the leaf fleshy. Flower color can be: white, red, pink, cream, purple, magenta or yellow, most of the flowers contain more than one color, color structure can be with stripes, dots, spots or shapeless , shape of pansy flower, there are six petal the petal in the bottom in butterfly shape or heart shape, the two side petals oval or elliptic and mostly with pointed top, the three top petals and organized like crown the shape of the petals triangle to elliptic shape and can be with pointed top.